Symbolism acquired its name in France. The term was suggested by Jean Moreas (ne Ionnis Papadiamantopoulos), in the literary supplement of Le Figaro of 18 September 1886. Moreas' subject was the so-called "decadent" poets; in his view, "Symbolist" was a more appropriate description. "Symbolic poetry," he continued, "attempts to clothe the Idea in a perceptible form which, though not itself the poem's goal, serves to express the Idea to which it remains subordinate...."
The poem is thus an attempt to render perceptible a reality which would otherwise remain ineffable. Such is the function of the symbol: to express what is absent, or, in the case of Symbolism, what is "transcendental" or "otherworldly". The transcendental was originally a category of religious thought: the God of the Jews and the Christians is transcendental. But transcendence is not necessarily or exclusively religious. There is much in reality which matters to us and yet remains for the most part out of reach, as though in another world. This is true of the past as of the future, and it also applies to that area of culture which serves as a repository of profound and enduring values. In order to speak of these things, we place our speech under the sign of the aesthetic, signifying that the reality of which we speak is not the practical reality of everyday. This sign might be a rhythm of speech, the recourse to music or to a particular register of colours, or a more or less emphatically hieratic or "unreal" form of representation. Jean Moreas' article dealt with poetry and not with the fine arts. But, despite the author's own reservations (he deplores the critic's "incurable obsession with labelling things"), artists recognized their own aspirations in Moreas' words and adopted the Symbolist label. He thus gave a name to something which had, till then, been no more than an ill-defined mood or state of mind. 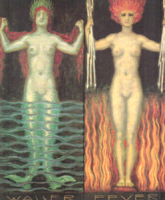 For Symbolism was not born in 1886 and an art applying the principles articulated by Moreas, and to that extent Symbolist, had already appeared in France twenty years before. I refer to the work of Gustaves Moreau. But before considering Moreau's work, let us give some thought to the meaning of the word "Symbolist" when applied to artists of that period. A painter may be termed a Symbolist for formal reasons, because of the content of his works, or for both these reasons at once. The first genuinely Symbolist painter was Gustaves Moreau (1826� 1898). The son of an architect employed by the City of Paris and himself a precociously talented draughtsman, Moreau enrolled at the Beaux-Arts at the age of twenty. He admired Delacroix and, in particular, Theodore Chasseriau, remaining under the latter's influence for some ten years. At the age of thirty he travelled to Italy, revelling in the art of the Quattrocento and in Byzantine mosaics. On his return to Paris, he exhibited at the Salon, where he won considerable success in 1864 with his Oedipus and the Sphinx, a painting of high academic finish. Five years later he gave up exhibiting for good. From then on he lived and worked at his town house at 14 rue de la Rochefoucauld, which has since become his museum. Its holdings include the majority of his abundant production (850 paintings, 350 water-colours and 5,000 drawings). Moreau was a solitary artist who chose a most unusual path. Though he was a contemporary of Manet and the Impressionists, his brushstroke and use of colour have nothing in common with them. This is a different world, peopled with figures from the Bible and classical mythology. Emile Zola, proselytising in favour of naturalism, dismissed Moreau's work as "a mere reaction against the modern world," specifying the ideological issues at stake when he added "the danger to science is slight". Manet (whom Zola rightly defended) may seem the greater artist on purely aesthetic grounds, but Moreau's work is nonetheless significant as an exposition of the cultural fantasies of his time. That solitary original, Gustave Moreau, developed a style of sumptuous preciosity. The abundant, precious detail, the "necessary luxury", were, in his view, an essential aspect of art. His subject matter was almost entirely confined to ancient mythology, historical legend I Alexander the Great) and the Bible (Samson and Delilah, Moses, Salome). Salome, who had forced King Herod to bring her the head of John the Baptist "in a charger", sees that head appear before her as she again dances before the King. Huysmans was aware of this; he wrote at length of the "Salome" who appears in a number of Moreau's works. The castrating woman is so widely encountered in the art of this period that one cannot help but dwell on its significance. It is treated in ironic form by Felicien Rops, in academic and conventional form by Franz von Stuck; it gained pathos in the paintings of Edvard Munch and terror in the work of Alfred Kubin. These are but a few of the artists who treated this subject: why does it recur so insistently? It goes without saying that the late 19th century was a singularly puritanical age. Now it seems that puritanism tends to appear spontaneously, untheorised and unsystematic, at times of great cultural mutation. Every revolution, political, religious or industrial, is followed by a phase of puritanical public discourse and legislation. This can best be understood if we allow that relations between the sexes are profoundly influenced by the unspoken rules of a symbolic social order. When the old rules and cultural forms are rejected or ignored, individuals lose their bearings. Thus a young man, confronted with a woman whom he desires, asks himself how he must behave if she is to acknowledge him life poignantly expresses the fallacy of dialectics of "nature" and "culture", the "spontaneous" and the "artificial". Even today, these notions fundamentally distort our perception of the manner in which the self is constructed through culture. 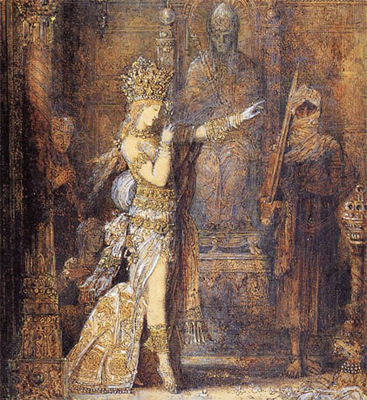 GUSTAVE MOREAU: "SALOME DANCING BEFORE HEROD"
Known as the "painter of Salomes", Moreau interpreted this subject many times, producing numerous versions after 1870. Some, like this one, were left unfinished or, in the artist's words 'in the process of execution": in fact, part of his method was to start a painting, then continue it later, often after a long interval. Moreau's Salome, a symbol of lascivious-ness "amid the heavy odour of perfumes", was the inspiration for A Reborns (1884), a decadent novel by the important art critic and writer Joris Karl Huysmans, and for the poet Jose-Maria de Heredia, who described these paintings as having "a magic air in which the smell of poison lingers". 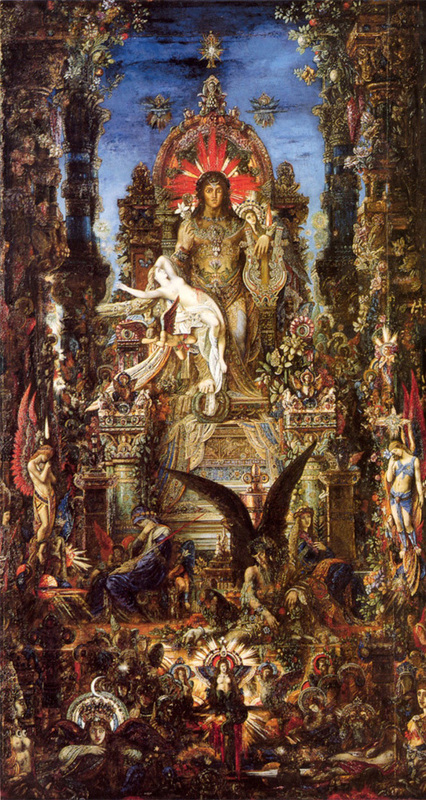 In his Salome paintings, Moreau embodied in his work the essence of a particular artistic and literary culture. "Of all artists there was one that threw him into long periods of ecstasy and from whom he acquired both masterpieces: Gustave Moreau. Des Esseintes lingered entire nights in contemplation over the painting representing Salome... In this work by Gustave Moreau, conceived quite differently from the details in the Bible, Des Esseintes finally found the extraordinary, superhuman Salome of which he had dreamt... an overpowering fascination emanated from that canvas. And yet perhaps the watercolour entitled The Apparition was more disquieting." This was how Huysmans recorded Moreau's Salome in his novel A Rebours (1884). The subject was extremely popular in the figurative arts, literature, and music towards the end of the centurv. This concurred with the misogynous attitude of the Symbolists; in the interpretation given in Heinrich Heine's text, we can see the prototype of the unbalanced, destructive female who seduces Herod to obtain the head of John the Baptist. Moreau had used this subject many times in his works, among which was the famous canvas exhibited at the Salon in 1876; it depicts a dancer whose whole body is tattooed in bold, swirling designs, an effect that adds to the sensuality of the figure. In contrast to Salome is the delicate female figure, reclining comfortably on the grass in the painting The Unicorns. The unicorns are symbols of chastity and purity, and the work suggests a feeling of serenity and comfort within the mythological subject matter. Young Girls by the Edge of the Sea. The simplification of forms and the use of flst areas of colour are typical of Puvis de Chavannes and constitute his principal merit. 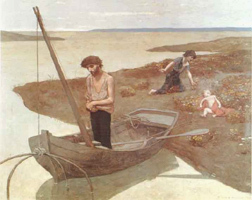 Pierre Puvis de Chavannes (1824-1898), for instance, might be be considered the official painter of the Third Republic. He produced a large number of allegorical subjects, but there is nothing particularly Symbolist about that. Innumerable academic painters treated subjects such as "Progress guiding industry" or "The arts bestowing their blessings on mankind". Today, Puvis de Chavannes' paintings strike one as insipid in colour and subject matter - to say nothing of the simpering expressions he confers on certain of his characters. Yet we cannot deny him a degree of originality in his formal and simplified organization of space and in the way he handles large planes of colour in works such as The Poor Fisherman. If we describe him as Symbolist, it is largely because a naturalistic or illusionistic representation of the world is not his primary concern. 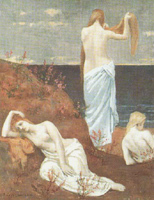 Pierre Puvis de Chavannes (1824-98) was almost contemporary with Gustave Moreau and the two artists are often associated with one another because of their different interpretations of the same concept of Symbolism. During a stay in Italy. Puvis was inspired to adopt classical models for a large series of allegorical works that celebrated personal and civic virtues. These were hung in various important buildings throughout France (from the Sorbonne and the Pantheon to the museums of Poitiers and Marseilles). His misty, poetic art sought mainly to achieve a linear rhythm applicable to the composition as a whole rather than to the single image. Puvis adopted traditional figurative values and kept his work clear and simple, with delicate, anti-naturalistic colours, in order to obtain an effect of unity. He expressed the fears of the contemporary human condition symbolically, through the nostalgic-evocation of an unchanging, archaic world of pure beauty and harmony.